K-Rain's Rotary Nozzle revolutionary multi-stream technology will maximize your sprinkler system's efficiency while beautifying your lawn and landscape. K-Rain meets the highest standards of water efficiency in the industry today. With proven matched precipitation and low flow rates, the K-Rain rotary nozzles reduce both labor and material costs in new installations and can easily retrofit an older system for increased efficiency. 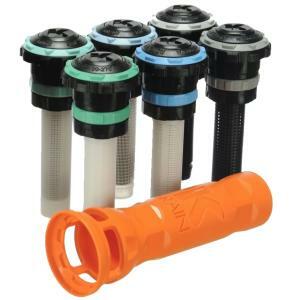 K-Rain’s Rotary Nozzle female threads are compatible with all male threaded spray bodies. Pairs well with the Pro S spray body with Nozzle Guard for added protection. Just about the easiest to adjust in the industry, making them a great choice for contractors and homeowners. Plus, these can be combined in zones with rotors. *Please Note: K-Rain Rotary Adjustment tool is optional and is sold separately.